Why is black and white photography so popular? Could it have something to do with one of our eras great self-deceptions? 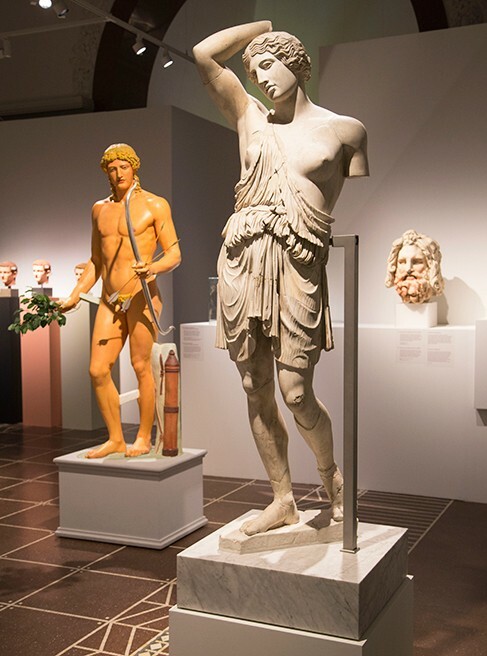 According to a new exhibition by the New Carlsberg Glyptotek, we Europeans have for centuries repressed and suppressed the truth about the ancient Roman and Greek sculptures. They were not white, but full of colour. This realization however did not fit in with our European self-perception as a unique and superior civilization, which celebrated the aesthetic and austere. And you have to admit it, you can’t help but be disconcerted by the images of Romans portrayed in the original and natural colouring. It’s as if a part of you wants to go back to the familiar and well known. Get the cleaners in and remove the grafitti! The exhibition is a culmination of 5 years research, when archaeologist Jan Stubbe Østergaard began investigating the sculptures with electronic microscopes and discovered that of all the 55 sculptures investigated up till now every single one have remains of paint. What’s amazing is that this is in fact the very first time an exhibition anywhere in the world has openly features sculptures with their original colouring. So next time you post your Instagram picture in black and white it may simply be an expression of centuries of cultural programming!